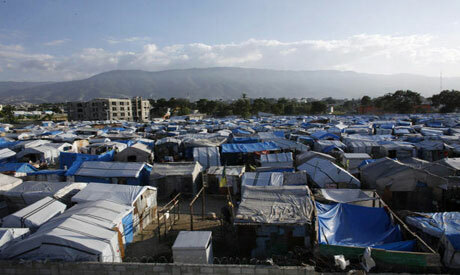 The United Nations said Tuesday it is readying aid to help Haitians cope with the imminent landing of Hurricane Irene on the island which is still reeling from 2010's devastating earthquake. "The preparations have commenced," Elisabeth Byrs, a spokeswoman with the UN's Office for the Coordination of Humanitarian Affairs, told reporters. OCHA said that over 100,000 shelters, enough food to feed 500,000 people for 26 days and medical kits had been prepositioned and the UN's peacekeeping mission in Haiti was also "ready to intervene at any time." Impoverished Haiti -- which along with the Dominican Republic makes up the Caribbean island of Hispaniola -- is still struggling to cope with the impact of the catastrophic earthquake in January 2010 that killed an estimated 225,000 people and which was followed by a cholera epidemic. Haiti dodged a weather disaster earlier this month when it was brushed by Tropical Storm Emily, but Irene revived fears for the 300,000 people still living in makeshift camps.